3 Benefits of dried timber. 6 What is mainly affected? 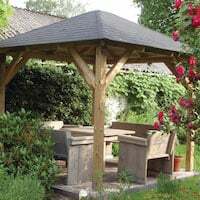 Summer in general is a complete pain for our industry, it’s at this point we get customers questioning the ‘quality’ of our timber used in some of our products as some cracks and splits start to appear in items that use posts such as play equipment and gazebos. Thankfully, it’s not just us either, every single supplier of timber products for the garden gets exactly the same thing. Summer historically costs the timber industry thousands upon thousands of pounds due to perceived ‘defects’ in timber by customers when 99% of the time no defect exists at all. Timber is a natural substance, we all know that. And, as it is organic, it is greatly influenced by it’s surroundings and more specifically it is trying to reach an equilibrium with it’s natural surroundings. Free Water and Bound Water. Free Water is water that is held within the wood via capillary action. It can be absorbed and expelled. Bound water is water within the wood that is bonded via hydrogen atoms. When timber is dried it will be the free water that is the first to leave. Before timber is used it is dried when most of the free water is removed (fibre Saturation Point of Wood (FSP)) FSP is achieved at about 25 – 30% moisture content. 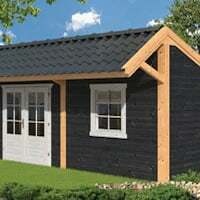 Wood is dried to it’s natural surrounding environment and as such is engineered to work within it to about 20 – 25%. Decay organisms generally cannot thrive in wood with a low moisture content. Many wood loving insects can only live in green timber. Dried wood has better thermal and insulation properties. Preservatives and finishes penetrate better with dried wood. Dried wood is generally a lot stronger than green wood. As I’ve mentioned wood wants to be the same as it’s environment both in moisture content and temperature. This is where we start to see a problem, especially during the Summer months and soaring temperatures. The timber starts to exhibit cracks and splits where it further dries out from it’s original point of FSP. It is, by its nature trying to reach an equilibrium with it’s surrounding air moisture. During summer this moisture content in the air is going up and down all the time as is the temperature and the wood is trying to do the same thing. Regardless of how well dried a piece of wood is it will always grow and shrink according seasonal changes in relative humidity of the air. 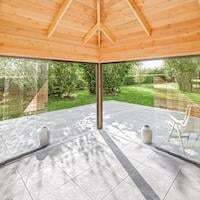 Changes in ambient humidity is all that is needed and will always affect timber regardless of any other influences. A good treatment can slow this process down greatly regulating how fast moisture gets in and out of the timber. Wood shrinks by different amounts in different directions, there is however very little movement in the grain lengthwise. There is some shrinkage radially and a greater amount tangentially (along the curvature of the growth rings). Here’s a picture of my gate post at home, the weather we’ve been having is having a major impact on it. You’ll notice that cracks and splits are appearing and will continue to do so at different rates. Most of the splits are occurring perpendicular to the growth rings because there is more shrinkage along the direction of the rings. At the moment this piece of timber is still drying to reach an equilibrium with it’s surroundings, the inner core is wetter than the outer but once that has dried to the level of the atmosphere virtually all these splits will dissapear. Here’s another basic but extreme example. Because of the different rates of radial and tangential shrinkage, distortion of the wood can occur. It can also cause radial cracks from the centre of the wood to the outer edge. This is because the circumference shrinks more than it’s radius and a big radial crack appears allowing the circumference to shorten. Here’s my post again showing a crack top to bottom, this is a radial split as above and will close up once the whole of the post has reached an equilibrium either by further drying or expansion as the moisture in the air increases such as Autumnal weather. Longitudinal crack along the radius of the grain. Here’s another example, this is a crack that’s just starting to emerge, they can appear very quickly during a hot day and often after installation if exposed in the hot sun or stored in a hot environment such as a garage. Gazebo Post Crack starting to appear. The same thing happens to furniture when out in the sun or a change of humidity. This is the timber from my picnic table I photographed yesterday, you’ll notice small cracks are just starting to appear. Cracks starting to appear in the top of a picnic table. 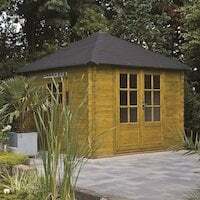 The properties exhibited here are mainly found in products that utilise posts such as our gazebos and outdoor play equipment. This is because the posts are made from a whole tree trunk. 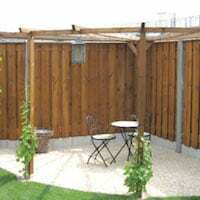 You can see that very clearly with my fence post as an example, this was not supplied via Tuindeco but by a local fence supplier, our posts however will be the same. This post has been in the ground for about 12 months and supports a gate. This post is encompassing both the ‘Heart’ and the ‘Pith’ of the tree and as such it shrinks and swells at different rates. A whole tree trunk is used as it is considerably stronger than the outside of the tree, If we were to use the outside then we would lose a huge amount of strength, the strongest part of a tree of course is the heart. As I’ve said and we all know, wood is an organic substance. It also tries its hardest to match it’s environment which you may not know. It moves, swells, and shrinks to do so and is normal timber behaviour. If however, it concerns you I recommend the use of a good quality timber treatment as this will restrict the moisture both entering and leaving the wood. Basically timber can be viewed as a bit of a pain! 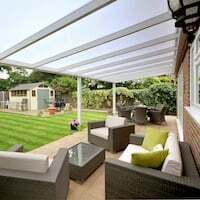 Customers sort through the DIY shops, they buy gazebos or other ‘post’ style products and immediately reject them as being defective, this is simply not true! Wood, by definition cannot be defective, there is nothing to go wrong other than obvious rot which is very rare in graded timber. If you experience cracks and splits in your timber, especially when it is obviously milled from a whole trunk it is not a ‘defective’ product, nor is the strength impaired, it simply is timber exhibiting it’s normal state and characteristics. Enjoy it and embrace it as it is part of it’s charm and warmth we all enjoy. Watch it and marvel at it’s behaviour, cracks and splits will disappear, open up, wander and move …. is it really a pain or a bloomin’ clever feature of a very basic material we all love? If you don’t like it, treat it with a good timber treatment and restrict the flow of moisture in and out. However! Even the best treatments allow moisture transfer, even plastic does to a certain extent. The ONLY thing to remove the transfer of moisture is aluminium as found in crisp packets! Cover your posts in this and they will never crack or split! I’m going to try and prove my own waffle, I’m going to focus on my fence post, bear in mind it’s been in the ground for about a year and I’m now going to try and study it. 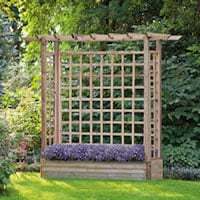 I’m also going to find a brand new post from one of our Gazebos, stick it in the ground and see what that does as well, for now, my fence post ….. Some of the radial lines looks smaller to me, or am I just imagining them? The split at almost 12 o’clock is smaller. There’s changes but nothing has really closed up. The week’s weather has had some rain, a couple of storms but not massive amounts, it’s still been pretty warm. Lets see what the next week or two does to it. The next time I’ll keep the camera back like the picture above so we can really see the changes ….. if any … or at least compare them better. A huge change since the last time I looked at the post. You can really see the change this time and most of the splits have closed up. Both the heart and the pith are reaching an equilibrium. Clever stuff wood! The splits that were showing in the side of the post have almost gone as well. Fence post cracks are almost gone compared to the summer months. I enjoy looking at the properties of timber, it fascinates me how it moves twists and turns yet remains the exact same strength. On a recent trip to a city shopping center it tickled me to see this split in a main supporting post. A crack big enough for my daughter to put her fingers in! Amazing stuff timber! This isn’t defective, it’s not a problem and its strength is not at all affected, I hope not, as it’s supporting a massive canopy in the cities new shopping centre! One of our employees had recently returned from a long weekend away in a log cabin – Lucky for some, I know. 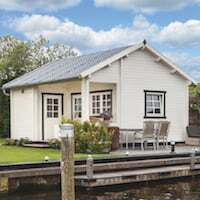 Although the log cabin she has stayed in is seen as a ‘traditional’ log cabin, meaning that they mostly use rounded/half round logs in their construction, the timber is similar. Just like almost every type of timber you’ll find, there will be cracks and split, but it hardly affected its use for our employee’s holiday! I think that the pictures show more than enough to prove that even with cracks, the log cabin is still standing strong and is more than suitable for the accomodation purpose it provides! 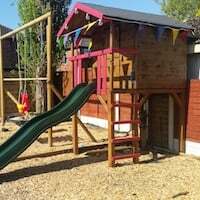 This entry was posted in Technical - Log Cabins and Timber, Timber Products and Information and tagged crack, cracking, shakes, splits, timber, wood by Richard. Bookmark the permalink. Nice read. 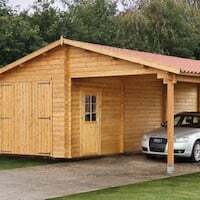 I have been looking for good sources about oak timber and other stuff that will help me in my DIY wood projects. Thanks for sharing a very informative post which I will definitely share with my friends. Oak is a lovely timber and can be left entirely untreated, much the same as larch. Some people like it to weather naturally, exposure to sun light will allow it to weather to a silvery colour, prolonged exposure to rain will result in a blackened look. If you want to keep the natural look of oak or larch you can apply a good quality clear treatment. 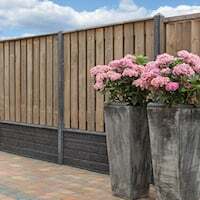 However, regardless of a treatment the wood will still naturally dry during the months of low relative humidity, likewise it will expand in higher seasons (Summer / Winter) At the height of summer your post will have a very low moisture content on the outside and it is highly likely it will crack and split. This is rarely a problem at all and the strength and integrity will remain. As we go into Autumn and Winter the wood will absorb moisture again and the natural splits will close up. 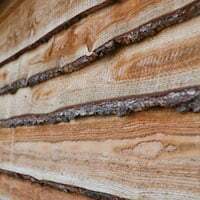 Great post , just googled timber splitting & has given a great explanation .i was just wondering do the dynamics remain the same with timbers inside your house ? We are doing a barn conversion & as you can imagine weird & wonderful colours & shapes . We have have had put in a solid chestnut swept block staircase which looks self supporting ,it was installed May last year 2016 & there are some real large cracks . Do we take it that the principle is the same ? Yes, it is exactly the same principle, timber will still contract and expand according to the temperature and humidity within the building. You will most typically see this in barn conversions due to the exposed timber. Luckily I have read this and get clear idea of y timber having splits. Can I just echo the comments above – I work for a building company and our clients have complained in the past about cracks in timber we’ve used in the gardens and I’ve never really known what to tell them. Other than that our long-in-the-tooth carpenters tell me they don’t have anything to worry about! How refreshing to find someone who is so enthusiastic about timber that they are willing to share their knowledge in such an accessible way. Thank you – I now feel much more confident in speaking to clients about this! I thoroughly enjoyed reading this , I only logged in to see how to treat a splitting wooden step . Half an hour later . It is so interesting and infectious you want to spread it around. Hi, Thank you for your comment, people forget that wood is a living product, especially when they see splits and then panic but they need to give the timber a chance to reach the same moisture content throughout, then the split or crack will go. It’s clever stuff. I like the black tar for a post that is in constant contact with the ground although for tanalised timber this is guarded against to a certain extent. Excellent, 25 years explaining and getting funny looks and you have it all here. Fantastic explanation and even better explained with the pictures – we get a lot of people asking about this in the summer so handy to point them toward this! Richard, your love of timber appears both genuine and infectious. It will probably persuade me to buy your product, more than any sales pitch could! Well explained Richard. Spot on!